The Facebook Pixel feature allows you to add your Facebook Pixel onto the pre-entry and post-entry pages of the sweepstakes. This will allow you to track pageviews and leads attributed to your Facebook ads, or if you want to build custom audiences. This feature allows for a quick and easy way to add your Facebook Pixel, without having to touch any code! If a Pixel exists in your Facebook account, you can find it in Facebook Ads Manager > Pixels. To get the Pixel, click Actions > View Pixel Code. From this Pixel Code, all you need is your Pixel ID, which is highlighted in the image below. Copy the ID. Note: The ID in the image below is unique to us. Your Pixel ID will be different than what is shown in the image. 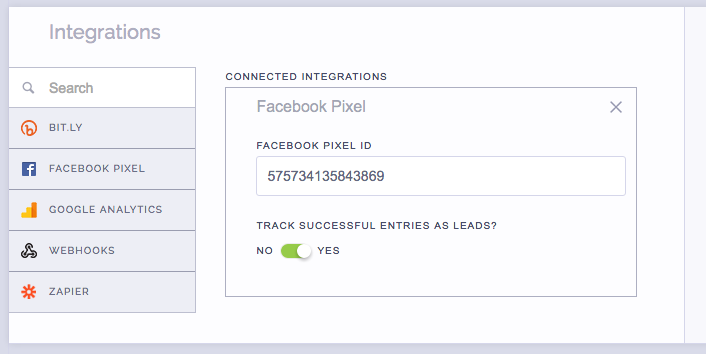 Under the integrations section in ViralSweep, click on Facebook Pixel, and paste your Pixel ID into the box. With Facebook's Pixel, they allow you to add a variety of standard events, such as purchase, add to cart, search, add to wishlist, lead, etc. In order to properly track a standard event, you must modify the Facebook Pixel code to include that event. 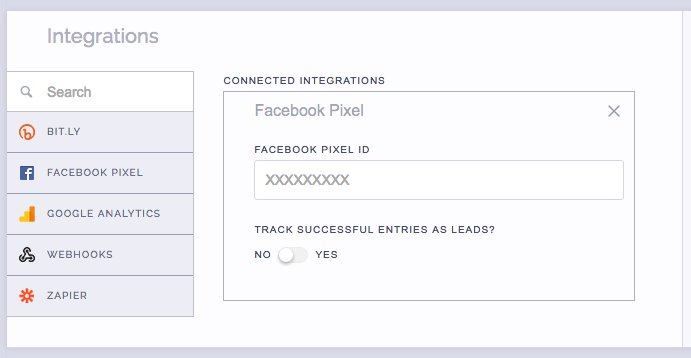 However, our Facebook Pixel feature removes that hassle for you, simply by allowing you to toggle on and off the ability to track your entrants as leads. Facebook classifies their "Lead" event as a signup being completed. In this case, ViralSweep uses this as the standard event when someone enters your campaign. If you toggle this on, inside of your Facebook Ads dashboard, you will see Pageview as well as Lead under Events. That's it! It really is that simple. Your Facebook Pixel has been added to your campaign and will begin tracking pageviews and leads if you have enabled it to do so. You will start seeing data being reported in your Facebook Ads account as soon as your campaign starts to receive entries. I want to add more Standard Events to the Pixel, can I do that? No, not through our Facebook Pixel integration. This is meant to be a simple integration that removes the hassle of editing Facebook's Pixel. If you want to add more standard events to the Pixel, simply add your pixel to the Tracking Scripts feature, located below the Integrations section. Be sure to remove your Facebook Pixel ID if you already added it to the Facebook Pixel integration. 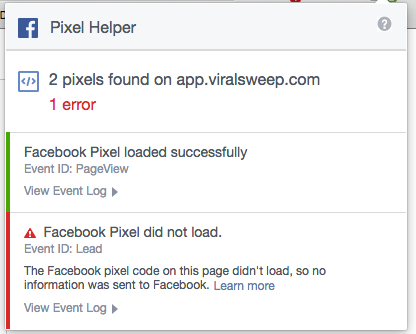 I'm using the Facebook Pixel Helper Tool, and it is showing the Facebook Pixel did not load. What happened? This is perfectly normal. 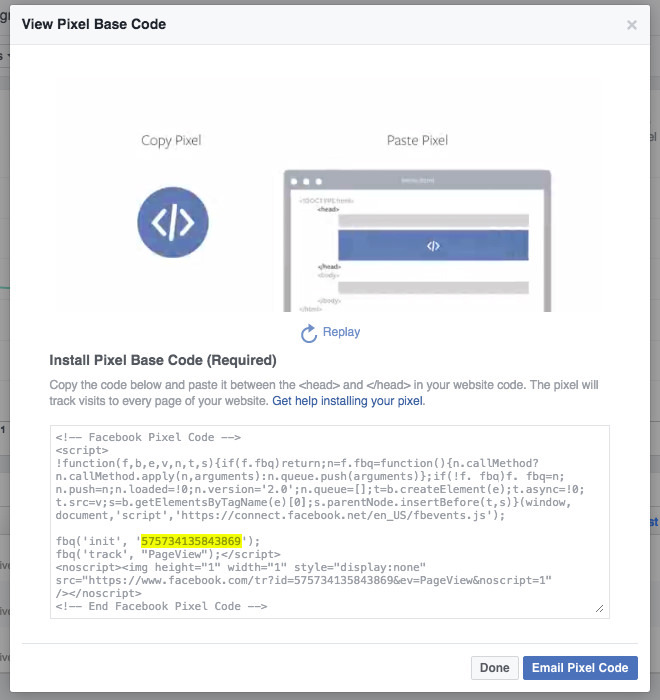 When using our Facebook Pixel integration and looking at the entry form on your sweepstakes, the Pixel Helper will show that the Facebook Pixel loaded successfully for the Pageview Event, but did not load for the Lead Event. Once you actually enter the sweepstakes, you will see that the Pixel Helper will update, and it will show that the Lead Event has successfully loaded. Inside of your Facebook Ads dashboard, it will then show you that it has registered a pageview and a lead. I'm receiving traffic to my campaign, but Facebook is not showing the data. What happened? Facebook has a delay in reporting of about 15 minutes or so. Simply give it more time and the data will eventually appear. Still having trouble with the Facebook Pixel integration? Simply click the support or live chat icon to get in touch with us.